I notice a good lack of forex discussions here except the exchange of feedback regarding forex brokers. I have seen a few mature and pretty good traders around here posting before and why not let's exchange or discuss pointers regarding forex? Who knows there might just be another Nicholas Tan (saw his forex book at popular yst but didn't buy it) in the making around all of us! We can exchange our feedback here regarding forex. Forums are to discuss and exchange our views. There are many experienced traders and brokers who like to share their views regarding forex and its trading. Xforex - Application to be regulated is still pending...Overall not bad but yet to make any withdrawal from them. do u have to pay for the FXCM demo ?? Another free software is MT4. Not that bad too. 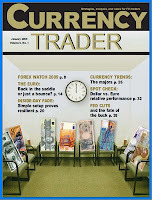 Currency Trader 2009 is out for download here. For those who are new to this, its actually a free monthly magazine in pdf format. Great for those who like to read up on Currency. This magazine would be beneficial for newbie entering this market. This will help them to know more about the market and it's trading strategies. yeah btw jeffsmith you trade with which broker ah? It is good that you have signed an account with Oanda. However, there are some disadvantages of Oanda. I was also in a mood to sign up with Oanda but when searched about it I found some disadvantages about this broker. I went to the site failyforex.com there I found a list of most of the online brokers where I found advantages and disadvantages of all the brokers. In this site, AVAFX is at number one and he position of Oanda is 22nd. There some other brokers too were you can read about them in detail.